Interreg is one of the two goals of the EU Cohesion Policy in the 2014-2020 period and it is funded by the European Regional Development Fund (ERDF). It has a budget of EUR 10.1 billion invested in the several cooperation programmes responsible for managing project funding. Interreg contributes around EUR 1 billion to EU external border cooperation programmes supported by the Instrument for Pre-Accession Assistance (IPA) and the European Neighbourhood Instrument (ENI). 2014-2020 is the fifth period of Interreg and therefore it is called Interreg V. In accordance with the new design of the EU Cohesion Policy and the targets set out in Europe 2020 Strategy, Interreg has been significantly reshaped to achieve greater impact and an even more effective use of the investments. Key elements of the reform are concentration, simplification and result orientation. Interreg V is based on 11 investment priorities (thematic objectives). Where does Interreg fit in the EU funding structure? 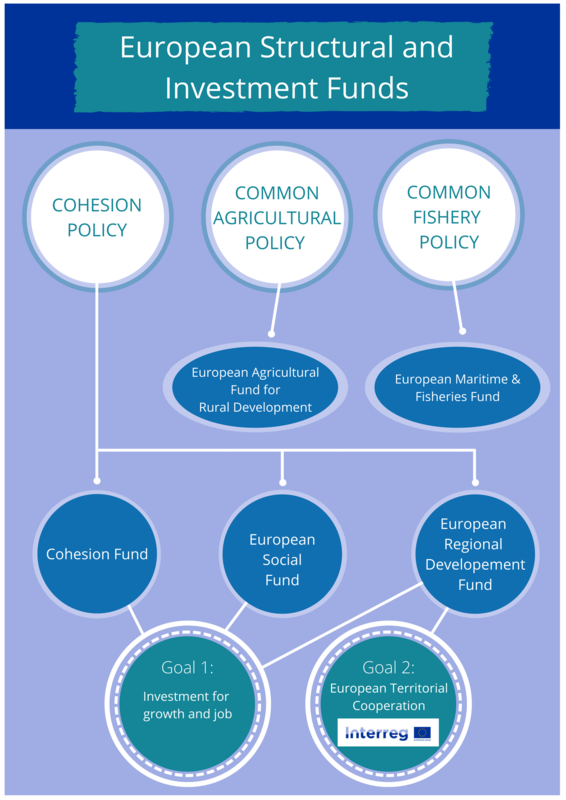 ‘Cohesion policy’ is one of the policies of the European Union funding hundreds of thousands of projects all over Europe from the European Regional Development Fund, the European Social Fund and the Cohesion Fund. It is the policy under which thousands of Interreg cooperation projects also get funding to tackle specific challenges throughout the European Union. The European Regional Development Fund (ERDF) is a fund allocated by the European Union aiming to help to redress the main regional imbalances in the Union. It aims to allow less advantageous regions to start attracting private sector investments, and create jobs on their own. Using our search programme interactive map you can find out which are the areas covered by your programmes. Interreg cross-border cooperation, known as Interreg A, supports cooperation between NUTS III regions from at least two different Member States lying directly on the borders or adjacent to them. Interreg transnational cooperation, known as Interreg B, involves regions from several countries of the EU forming bigger areas where it aims to promote better cooperation and regional development within the Union by a joint approach to tackle common issues. 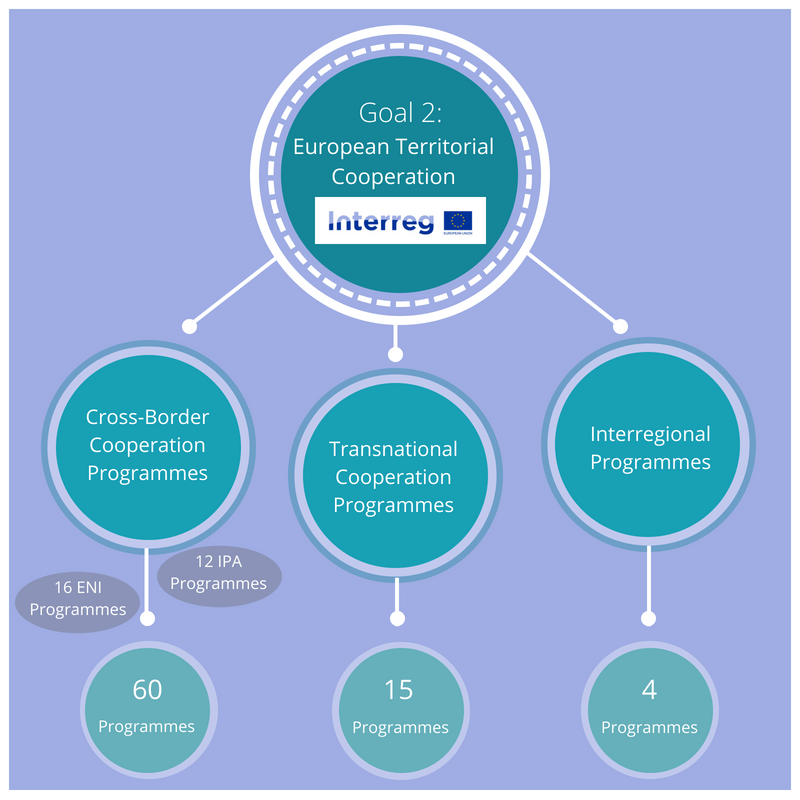 Interreg has 4 interregional cooperation programmes, known as Interreg C : Interreg Europe, Interact, Urbact and Espon. The interregional programmes are geographically “pan-European” covering vast areas. Interreg IPA CBC supports cross-border co-operation between candidate countries, potential candidate countries and EU Member States, to contribute in their accession preparations with a territorial and cross-border focus.